You can start reading the book - at last ! After writing for non-Christians,and then re-writing for Christians, and then re-writing for the non-churched and ex-churched, I have decided to write for all of these groups together and hope that whoever reads the book will find themselves engaged by it. So, after lots of fiddling around, I am ready to give you the draft manuscript of the book, bit by bit, and ask for your earnest and honest critiques in the hope that it will be finished its "peer review" by Christmas (you are the peers) and I can look at publishing it and completing the website early next year. Let me know if you have any difficulty getting either of these and I will email you a separate copy. My plan is to put each draft chapter up at similar locations every two weeks or so, beginning with Chapter1 in mid September. I will let you know when each draft reaches its destination through this blog site. Thank you for your love and patience. I will really appreciate your corrections, criticism and suggestions as you review each piece that is posted. Although my science degree (from 50 years ago) is in Physics, I like to keep in touch with where mankind is up to in appreciating and understanding God's wonderful creation in other areas as well - like chemistry, biology, geology and astronomy. So please indulge me and let me digress a little to talk some science. Newton's Universal Law of Gravitation states that any two objects exert a gravitational force of attraction on each other. The direction of that force is from the centre of one object to the centre of the other. The size of the force is determined by the size of the objects and their distance apart. For any two particular objects the force on one is the same as the force on the other, but the effect of that force will be more visible on the smaller object. Let me illustrate by considering the earth and me. We attract each other with a force of about 800 “force units” (in the metric measurement system). If I step off the top of a building, remove the “obstacle” between me and the earth, this force causes us to come together quite rapidly. But which one of us does the moving? The force of 800 force units is not enough to get the earth moving towards me, but it sure moves me towards the earth. So, small objects will move towards, and may eventually collide with, large objects because the force of attraction between them gets the smaller one moving more easily. I knew you'd be wondering by now. I see the law of love working in the same way as the law of gravitation. They are both universal laws put in place by God - one in the physical realm and one in the spiritual. In the universal law of love, God is the big object and mankind is the small one. There is a love force of attraction between God and us whose direction is from the centre or heart of God to our centres or hearts. That force is always acting so that when obstacles between us and God are reduced or removed, we will start moving towards God - and will eventually meet him, be united with him. Jesus referred to this when he said that he would draw all people to himself. It might take a while, it might need lots of obstacles to be removed, maybe reduced bit by bit, but eventually all people will meet him and be united with him. In Chapter Four of THE GOOD NEWS ABOUT GOD I talk about Jesus being the Saviour of the world. In discussing this, I assume the position that sin is a fact and that a Saviour is therefore necessary. My recent thinking about atheism and evolution have made me realise that a growing proportion of people do not make these assumptions. The TV vision of the recent London riots and associated criminality alone should give everyone a clue that sin is rampant in our world. Yet, many are still blind to its existence or its relevance to their lives. One of the reasons for this, I believe, is the growing saturation of our secondary science curricula and media presentations with evolutionary indoctrination. In our monthly RACV magazine, a medical doctor writes a column on some aspect of public health. In this month's edition, he was promoting the health virtues associated with swimming and began the column entitled "In the Swim" with "Once we were fish and then most of us stopped swimming." No wonder hordes of us believe the evolutionary story is true. Even many Christians think that evolution is only a side issue and can be believed alongside their basic Christian beliefs. there is no need to be reconciled to God. And being unreconciled to God is the definition of death - no life ..... in the kingdom. But Christian faith leads to life, life in the kingdom age, so how can these two positions be compatible? I am going to try to work this in to Chapter 4 in some way - not as a major point but as a passing comment to get readers to think a bit about this area while they are reading about Jesus being the Saviour of the world. 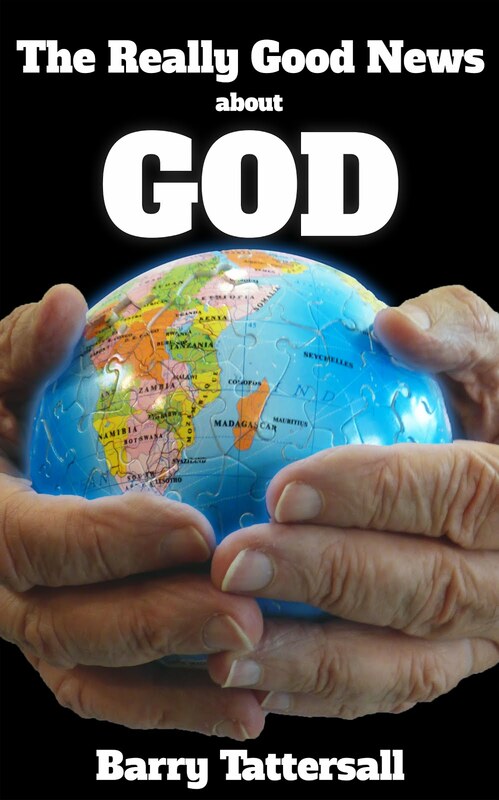 In Chapter Two of THE GOOD NEWS ABOUT GOD (my working title for the upcoming book) I talk about the sovereignty of God, how God is in total control of everything. In discussing this, I assume the position that God does in fact exist. Although I don't want to get into a debate on the existence of God in this book, I thought I might use the theme of this chapter to point out the stupidity of atheism, and a couple of consequences of holding such a position. Atheism is considered to be a non-religious position, the non-belief in a God or deity. But atheists generally are very committed to TWO religions, two belief systems of their own. A cursory reading of evolutionary literature quickly demonstrates that the theory of evolution is a belief system which is held with more passion than most Christians hold to their belief system. Although it is promoted as a science, the theory of evolution is certainly not a science as it cannot be even demonstrated experimentally, let alone proven by scientific practice. And humanism is the second religion of atheists, the belief system that promotes humanity as the sovereign deity and only saviour of this planet. I find it interesting that these two religions oppose each other yet are held by the same people. Evolution says that we all appeared as a result of natural, random processes. We can't take credit for anything we do or think or feel or decide. These all happen the way they do because of the way we are, the way we have evolved. We are no more in control of ourselves or of our behaviors than is a cog in a wheel or a rock on a hill. We just do what is consistent with the way we happened to end up in the evolutionary process. Humanism, on the other hand, says that we have the capacity and brilliance to determine and control the future of mankind, including solving all its problems..
That's aiming a bit high for a cog or a rock, don't you think? If we follow the atheism/evolution connection further we would also come to some other interesting, but demeaning, conclusions. Since no-one is responsible for who they are or for what they can do, all behaviour is just part of the package we have become. A loving hug is the same as an act of murder; the skilled person is exactly the same as the unskilled - all are the result of random, undirected processes over which we had or have no control. Everyone is just doing what they are made to do, what they "just have to do" because of who they have become. What meaning is there in a life explained by an atheist or evolutionist? We are just robots doing what the particular mix of physical and chemical bits that was our lot determine we should do. No wonder people brought up on a diet of atheism/evolution have no hope, see no future, see no purpose in life. Guys and Gals, I would be very interested to get some solid feedback on this blog.